If you're looking at a new car purchase in the near future, you should be doing a lot of research about different vehicles out there. Depending on what you're looking at, you might notice multiple prices for the same car. 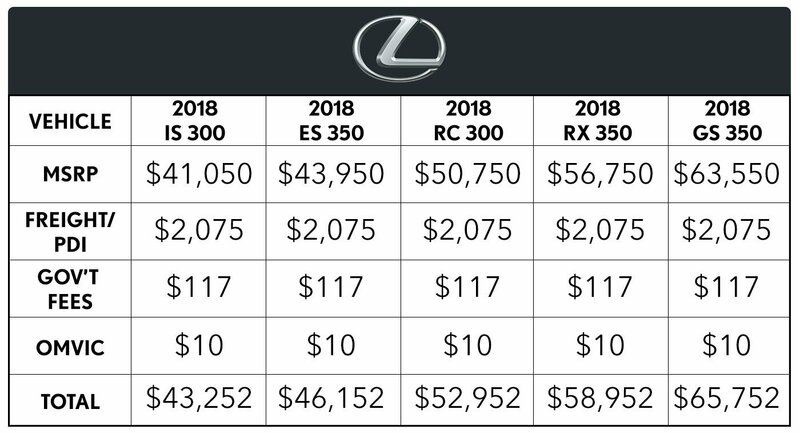 For example, a TV commercial may advertise a 2018 Lexus IS 300 differently than the price you might see on a website. This might be confusing, but the reasoning is pretty simple. Many outlets will only show you the MSRP of the car (Manufacturer's Suggested Retail Price). This is set by the Manufacturer, for example, Lexus, as a recommended sale price, and is the only one that an outlet legally has to show. 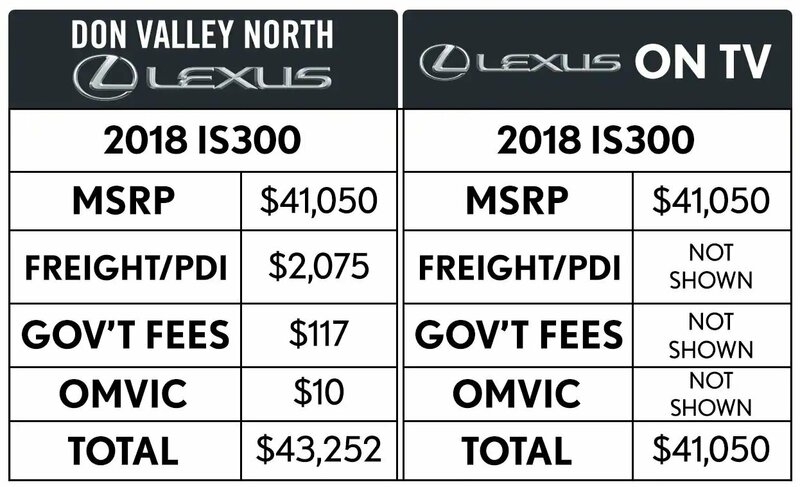 However, at Don Valley North Lexus, we want to be upfront about our prices, which is why we include all fees in our pricing. In Ontario, all dealerships must advertise their prices according to OMVIC (Ontario Motor Vehicle Industry Council) regulations. One of those regulations is, we must advertise the "All-In Price", which is MSRP (Manufacturers Suggested Retailing Price) plus all applicable fees and levies such as Freight & PDI, the Environment Handling Fee, OMVIC Fees and Tire Levies. Not all advertising complies with this regulation, and sometimes you will just see MSRP Advertised. All dealerships will charge the "All-In Price", but you might not know that until you're sitting at the negotiation table. At Don Valley North Lexus, it is our policy to be upfront, honest and clear about our pricing. See the graphic above for a complete breakdown of pricing. What does Lexus recommend for the engine break-in period? The engine of your new Lexus vehicle is made with industry-leading precision and quality. As a result, the break-in procedures listed in the Owner's Manual for a brand-new Lexus are optional. While following these procedures may help to optimize engine performance and engine longevity over the life of the engine, these potential benefits are marginal compared to the benefits that result from ensuring that recommended maintenance is performed as scheduled. When the system is set on Recirculation Mode, does fresh air still enter the vehicle? The air conditioning system is designed to allow up to approximately 10 percent of the air coming from the air vents to be fresh air from the outside. The exact amount of fresh air entering the vehicle on recirculation mode will vary. If the A/C system is turned on in the AUTO mode, then the A/C ECU switches the air intake ducting between "fresh," "fresh and recirculation mix" or "recirculation" according to the required outlet air temperature that the ECU calculates. This calculation is based on the temperature that is dialed in with the control knob, the interior air temperature and the operating conditions. What causes vapor/steam to emit from the air conditioner vents? On humid days, water vapor in the air may condense and freeze inside the air conditioning evaporator. A minimal level of frost in the evaporator does not affect cooling airflow. If enough ice builds up in the evaporator, it will reduce or block cooling airflow. This would usually be on an extended drive rather than a short trip. If the evaporator freezes up, or if the A/C button is turned off, the ice will melt. The A/C can be turned back on after 10 or 15 minutes and should blow cold air again. In order to minimize freezing of the evaporator, the A/C system can be run on Recirculation Mode and the temp can be set at a level of, say, 72 degrees, with the fan at a medium range. Also, a dealer may check the A/C system to ensure that the evaporator condensation drain is clear. How is the available driving distance calculated from the remaining fuel left in the tank? This video shows how to use the Blind Spot Monitor with Rear Cross-Traffic Alert available for LS and ES models. LS shown, ES similar. This video shows you how to use Voice Command to play a playlist for a connected music player, and turn on and use expanded voice commands. This video applies to 2013 models equipped with navigation, except GX. ES with remote touch controller is shown, IS and LX with touch screen operate similarly. Yes, in most models equipped with a Lexus Navigation System, DVDs can be viewed when the parking brake is engaged. See your Owner's Manual for details.